Unfortunately, the dress you are looking for (Style: DC-D44469, Name: DC-D44469) is no longer available. 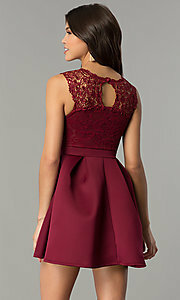 Why pay more for a short wedding-guest dress when you can have this adorable option for less than $50? The charming party dress offers an affordable style choice for holiday celebrations and cocktail parties when the reception is but a memory. Delicate openwork lace at the high neckline tops the fitted sweetheart bodice before flowing over the shoulders to beautifully frame the back keyhole detail. Box pleats add fullness to the short a-line skirt that is made from a wrinkle-resistant scuba fabric to keep it looking fresh after a long night of dancing. Figure-flattering and budget-friendly, this short wedding-guest dress is a sweet style for your semi-formal event. The model wearing wine is 5'9".